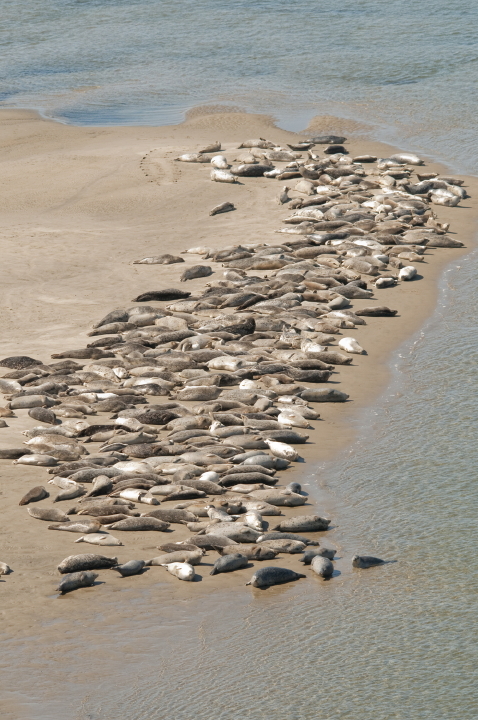 Harbor seals do not migrate great distances. They generally use secluded beaches and remote rocky areas along the ocean shoreline and within bays and estuaries from Japan to eastern Russia, Alaska to Baja California, South Carolina to Greenland, and from Norway to France. They can frequently be found in the same locations year round, with seasonal movements in northern latitudes. They are commonly the most shy and wary of local seal species, and are easily startled by motion or noise. 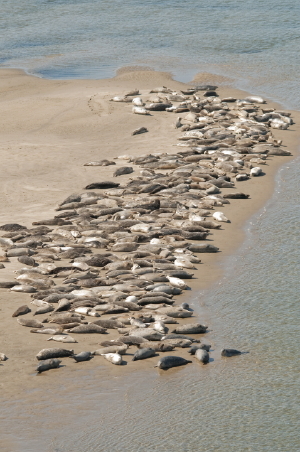 Seal resting areas are typically called "haulouts", and may be any convenient perch, particularly above water at ebbing tides. Birthing areas are often called "rookeries", and tend to be more level and protected than haulouts. While seals may move from one haulout to another during foraging, rookeries are used more persistently - often year after year by large groups - and pups may be left for extended periods while their mothers feed. The images on the following pages have been provided by "seal watchers" from many locations. They often required the use of a telephoto lens or an approach from a hidden access point to avoid interference. Images have credit listed in the [ info ] tag and a [ link ] to the provider's webspace if not a SealWatch.org photo. In most close-up pictures of harbor seals, at least one is looking at the camera, likely serving as a sentinel. The first sign of disturbance is a "heads up" alert by several seals, followed by flight into the water by the individuals most alarmed. In worst cases, the entire group leaves.